Fitness North – Journey to my heart…. I had to smile today when I heard myself tell a friend that I feel like I am morphing. I am down 20+ pounds in just under four weeks. The journey has been long-awaited and now feels delightful. I feel like my body is changing weekly and today I was keenly aware of something I did not really anticipate. As I picked out my clothes today I had a bit of a panic moment. Because my body continues to shed weight as a result from my great experience at Fitness North, I realized that I might not be wearing my favorite clothes for very long. I have already set aside many things but today I looked at some of my sweaters and wondered if they will fit in two or three weeks. I realized that part of this process is leaving things behind ~ and some of those things are items I have liked or enjoyed. But it was a fleeting thought and realized I will be enjoying new favorites. So, I unclenched my fists and remembered to live open-handed, ready to release or receive whatever God has for me. I am growing in the confidence of my new being. I feel healthier and have a deep sense of wonder at the process I am currently living. I am thankful for many things this week (a blog for tomorrow night) but I also find that I am often in a thankful frame of mind….and that brings a wonderful sense of contentment in the day-to-day. So, if you are home Wednesday evening, please tune in and catch a glimpse (or however much NBC decides to share) of my experience at Fitness North…. 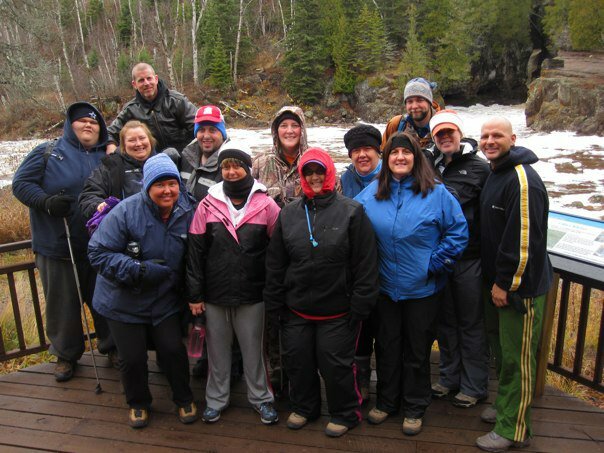 In late October, we launched our new live-in weight loss and fitness program at Surfside on Lake Superioron Minnesota’s North Shore. Fitness North co-owner and Season 9 Biggest Loser participant, O’Neal Hampton and his daughter SunShine inspired the first ever Fitness North participants and the North Shore community with their more than 290 lb combined weight loss. NBC TV was on hand to film the Fitness North launch and plans to include co-owner O’Neal Hampton and his daughter SunShine in an NBC Thanksgiving eve special titled “Where are they now?” We invite you to watch the NBC special this Wed., Nov. 24 from 8-10 p.m. to learn more about Fitness North and how you, too, can change your life. We’re excited to see our Fitness North Family from the first program on national TV. has a quote on the wall that I saw tonight while watching Biggest Loser that said “stand up and finish what you started…. It was a good reminder to me tonight to stay focused on my food intake, my exercise and so much more. I started to think through how many things I begin and walk away before I am fully finished. It is the simple things like drying and putting away the dishes after I washed them, putting away the folded laundry or putting my clothes away at the end of the day. I am thankful that tonight these words struck my heart and remind me to stay focused on the task and see everything through to completion. I can start to anticipate only positive change if I live this simple concept out….positive change to my body, my home, my routines, my workplace and my relationships! And with that I am going to press on to the end and reach my potential! Author trishborgdorffPosted on November 16, 2010 December 1, 2010 Categories Fitness North1 Comment on Bob from Biggest Loser…. the experience and the community…. I have been home from Fitness North for one week and I continue to be grateful for my two-week experience in Minnesota. I am practicing feeding my body on a schedule and working out 45 minutes a day of good cardio exercise. Life is manageable and I am grateful. And as I reflect on what made Fitness North as great as it was, I come down to two words….experience and community. The experience of working out 8 to 10 hours a day was amazing. I learned to break the day down into bite size (ironic, isn’t it?) pieces. I learned to believe I could do whatever task was before me and not allow my mind to psych me out. I learned to believe in my strength and celebrate movement…of more than the scale. The experience I had is one that I will hold close to my heart for years to come. I learned and I grew thru the routine, the structure, the blood, sweat and tears and the celebration. The community I experienced in those two weeks was more than I ever hoped for. The power of my fitness north family will be with me for many years to come. I drove down 28th street last night and was hungry. I battled thoughts of a quick burger from here or there and then i remembered the faces of those who are making sacrifices with me. I envisioned Shannon and Wendy and Heather. I thought of Robyn, Shari, Cara, Karen and Sheryl. I remembered Justin and Mike and Leif and Jay. I heard the words of O’neal and I drove down 28th street with a renewed sense of commitment. I knew I was not in this alone and again, I was thankful. I wonder how many times you have tried to change alone. I know that my success rate increases the more I am willing to live in community; honest and supportive community. Asking for what I need, offering what I have to give and living with an honest and compassionate heart towards myself and those on the journey with me. Fitness North has offered me this in my weight loss journey…. Open Hearts has offered me this in my journey to my heart…. My family has offered me this in their loving me every day, in the valley, on the flat road and on the mountain top…. I am forever grateful that God designed us for relationship! I believe it is good to be gone but great to be home. I love coming home! I enjoy the familiarity, the comforts, the routine, the great people I work with and interact with every day. I am not a person who longs for vacation and finds home boring. I am very blessed to be someone who enjoys going away but loves coming home! How do I feel about that? I signed my email to Leif with the following words….I am ready and waiting….hopeful and thankful…anxious but trusting! The plan will require me to stay on task, sacrifice some things I enjoy and work hard, but as I was reminded often at Fitness North, that is all temporary. The end result will free me to live a healthier, more active, longer life (unless of course, God has a different plan). And so today I realized that while I was at Fitness North I did just what I was told, I exercised hard, prepared the food, ate what I was told when I was told, slept great and lived in a single focused community. It was a wonderful experience and I was very obedient. When I stepped off that plane, I know I need to transition from obedient to discerning. Now that I am home, it is now time for me to make choices that support my vision. It is a journey. At times it feels like a journey up a mountain and other times a coasting down a hill….but either way, I must keep my destination in mind and ensure that my mind is focused on where I want to be, for the long-term, not in this moment of pleasure or satisfaction. My journey continues and I welcome your support, encouragement and prayers. I will be updating with a loss report every two weeks so you can celebrate with me as I live out my vision! Author trishborgdorffPosted on November 8, 2010 December 1, 2010 Categories Fitness North1 Comment on home again…. Author trishborgdorffPosted on November 7, 2010 December 1, 2010 Categories Fitness North7 Comments on The results are in…. discovered that she was the one she’d been waiting for…..celebrate her self-reliance! And so my two weeks at Fitness North is drawing to a close. It has been a time of adventure, excitement, exhaustion, exhilaration, sorrow, tears, friendships and amazing support. I have learned that I have what it takes to challenge and care for my body, mind and spirit. I have learned about new expectations and new limits, my inner strength and the amazing power of community. I am not a runner (yet) and I still have fitness goals that have not yet been achieved. I have goals and a plan for my weight loss journey and I am returning home on Sunday with a sense of contentment with where I am at. I have worked hard and I am thankful that I don’t have to work out 9 to 10 hours a day at home. One thing I want to be sure to say…. We were the first ever group at Fitness North. It is inspired by O’Neal’s (from Biggest Loser) weight loss journey. It is not a duplication of what you see on Biggest Loser. I was so touched, day in and day out, but the kindness and compassion offered to us throughout the many hours of exercise. They do not yell like Jillian nor jump on our backs and demand more. O’Neal, Sunshine, Leif, Jay and Sheryl were honest and forthright and did not let us give up. If any of you are looking for an experience that will challenge you, inspire you and call you to live your life in a more healthy and active fashion, let me know and I will connect with you to share how you to can have this opportunity! And so as I leave this beautiful setting on Lake Superior, where the waterfalls roar and the gentle streams flow, I am assured that God has equipped me with everything I need to continue on. I look forward to the ongoing journey and am grateful for each and every experience and each and every person who have been part of my journey thus far. Now, I am off to my last chance pool workout to burn the last of the calories before my six am weigh in. A lot happens in a day at Fitness North, but tonight I am remembering something new I learned about our bodies. Leif was sharing with us that our bodies will continue to lose weight when we get home because we have reset our metabolism during our time here. He also shared that although we are having results, we may not see it right away because our bodies first lose the visceral fat that surrounds our vital organs. After that process, our bodies will burn the fat around our waist lines and other gathering places. I just am amazed at how God has designed our bodies in all of their functioning. I am pleased that my body knows first what I need, before giving me what I desire. Saturday I will find out my numbers, but just knowing that little tidbit helps me to feel healthier already. And so at the end of this day, I am thankful that I am (and you are) fearfully and wonderfully made!